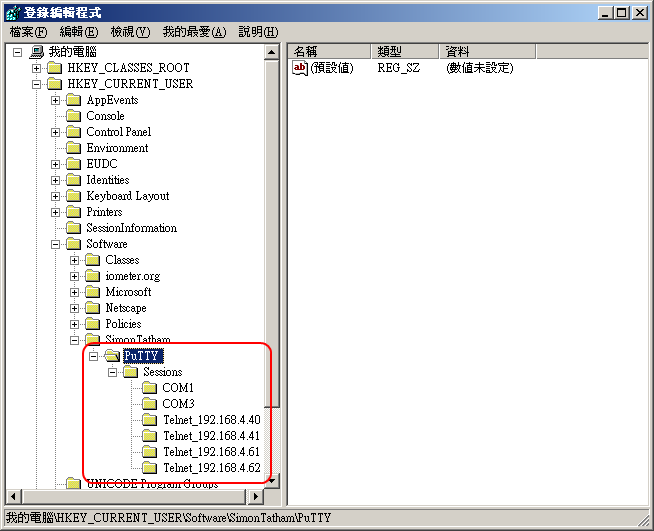 PuTTY 不只提供了序列埠Serial (Com) port 的連接還可以使用在 Telnet / SSH … 下載後不用安裝直接就可以使用,先來看看 serial 的設定. 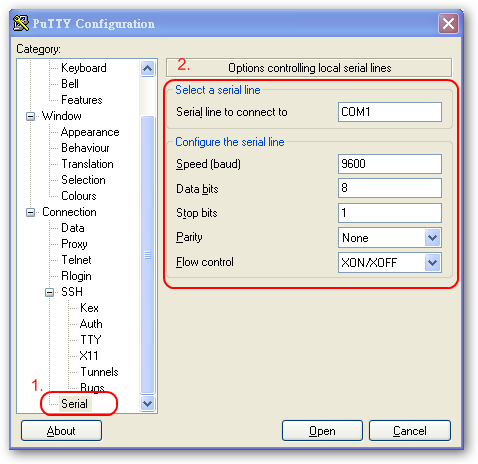 設定好之後就可以回到 session 進行連線,在 "Connection type" 選擇 Serial 就會載入我們剛剛在 serial 所設定的設定值". 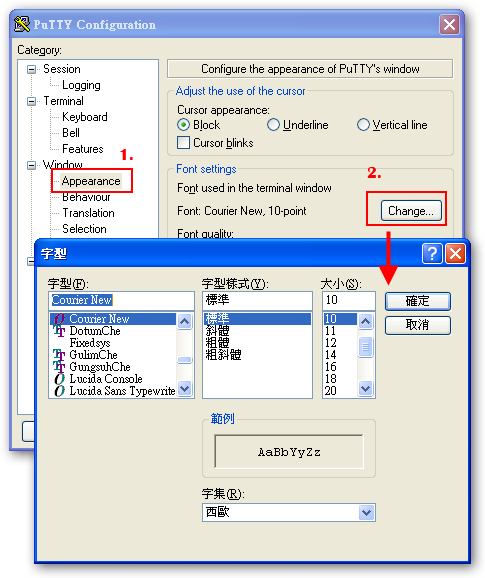 預設的自行很小所以在 Window / Appearance 可以自行設定顯示字型大小. 在 Font settings 可以看到預設的字型,點選 "Change" 可以更改顯示的字型大小. 如果要將 console 的顯示過程記錄下來可以透過 Session / Logging 裡的設定. session logging 選擇 "Printable output" 會記錄所有顯示在 Putty 視窗的文字. "What to do if the log file already exist" 使用預設的 "Ask the user every time" 總是詢問使用者. 並選擇 Log file name 的位置與名稱. 如何要將 putty 設定檔儲存下來,在 putty 的設定選單裡面是找不到儲存等相關功能,因為 putty 是將資料存放在 windows 的 register 裡面,必須透過 regedit32 將 putty 的設定捉取出來. 要將設定檔存放至新的環境只需在 putty.reg 按右鍵並選擇 "合併" 即可在新環境中使用.